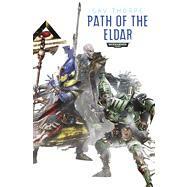 The eldar of the craftworlds devote their lives to the pursuit of perfection, following a series of paths which will their actions and decide their fates. Three friends – Korlandril, Thirianna and Aradryan – part company to walk their chosen paths – Warrior, Seer and Outcast – little realising how the actions of one will affect the others, and indeed their world. As Aradryan’s choices bring the wrath of the Imperium down upon Alaitoc, it falls to Korlandril and Thirianna to defend their home – if they can avoid becoming stuck on their paths and being lost forever. Gav Thorpe is a New York Times bestselling author. He has written many Black Library books, including the Horus Heresy novel Deliverance Lost and the audio drama Raven’s Flight, as well as the epic Time of Legends trilogy, The Sundering. He is currently working on a new Dark Angels series. Gav hails from Nottingham, where he shares his hideout with the evil genius that is Dennis, the mechanical hamster.